A few months ago I declared a most enjoyable and very affordable Grüner Veltliner wine called ‘Little J’ my Wine of the Week. Having done so, the wine’s UK importer, Awin Barratt Siegel Wine Agencies, asked if I’d like to sample some more wines from the range, and the five bottles below duly arrived. I’ve also added my note on the ‘Little J’ for completeness. 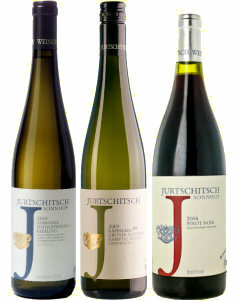 Little J’s producer is Jurtschitsch, a family-run business with three generations of Jurtschitschs involved including current winemaker Paul Jurtschitsch, though the first written records of wine being made on their farm date from 1541. Parts of the cellar originate from the 14th century. Although Riesling and Grüner Veltliner are their main products, the Pinot Noir tasted here is not a new invention: 1868 was the year the first Pinot vines were planted in the courtyard of their estate in Langenlois in the Kamptal region near Vienna. Since 2009, their vineyards have also been certified organic. This has a hint of tropical fruit and even an estery banana note on the nose, some lightly custardy creaminess and a sprinking of white pepper. On the palate it is full and generous, and the flavour just bangs out of the glass with loads of apple and citrus, and again that little clove, pepper and spice background from the grape. Nicely confident and characterful stuff, it would be great with a bowl of gnocchi or pasta with pesto and chile. 88/100. £8.99, Inverarity One to One. See all retailers on wine-searcher.com.